Nowadays, in many cultures, families are getting so busy that quality family time is becoming a rare commodity, if not a special treat. Although time for shared meals and activities is often hard to orchestrate as busy schedules make it difficult to get together, family time is an investment worth making. We spend most of our life making investments—education, professional development, activities/hobbies, etc. Why not invest equally or more in the lives of the people closest to us, our family? In preparation for our upcoming Healthy Lifestyle Challenge, I’m reposting all nine lessons from the Blue Zones (BZ). The lessons are simple, yet powerful, and can help put anyone on the path to a healthier and happier life. Successful centenarians tend to build their lives around family. It is their core. They marry, have children and consider familial duty, rituals and togetherness an intrinsic way of life. Zeal for family is evident throughout their whole life. By the time they reach 100 years old and beyond, their lifelong devotion to their family is reciprocated by their children’s love and care of them. In four of the five Blue Zones, the younger generation welcomes the older generation into their homes and lovingly checks up on them regularly. For them, it’s a natural way of life. Studies show that elders who live with their children are less susceptible to disease, eat healthier diets, have lower levels of stress, and have a much lower incidence of serious accidents. They also are found to have sharper mental and social skills when living with family. As I find ways to invest in my son’s life, I often think of rituals I want to establish in our home—meals together, holiday traditions, family vacations, weekend activities, daily routines, etc. As children thrive on rituals and enjoy repetition, every night either my husband or I read to our son as part of his bedtime routine. The other night however, I went in and sat with both of them. My son sat across both of us, his torso leaning against mine while his legs draped across my husband’s lap. The fact that both of us were there to read to him brought him so much joy that he looked at both of us and giggled in delight, as if he perhaps had arranged our little gathering. It’s not always possible for all of us to read together before his bedtime, but I thought perhaps as a family we should try to do it more regularly. An investment I’d like to try and make. Invest time and energy in your children, your spouse, and your parents. Play with your children and talk to them, nurture your marriage, and honor your parents. Unplug the electronics and spend quality time with each other. Successful families make it a point to spend quality time with one another. Make at least one family meal a day sacred and time to be together. Establish traditions and family routines. Create a space in your home to display photos of family—deceased loved ones, parents, and children. Take annual family photos and display them in progression. Photos serve as a constant reminder that we are not alone and instead connected to something bigger—family. If you live in a large house, consider living in a smaller house to create an environment of togetherness or establish one room where family members gather daily. It’s easier for families to bond in smaller spaces. I’m so excited!! Our Healthy Lifestyle Challenge starts next week!!! Won’t you join me!! Chocolate. Check! Orange. Check! Cardamom. Check! Delicious, vegan and gluten free. Check! Check! Check! 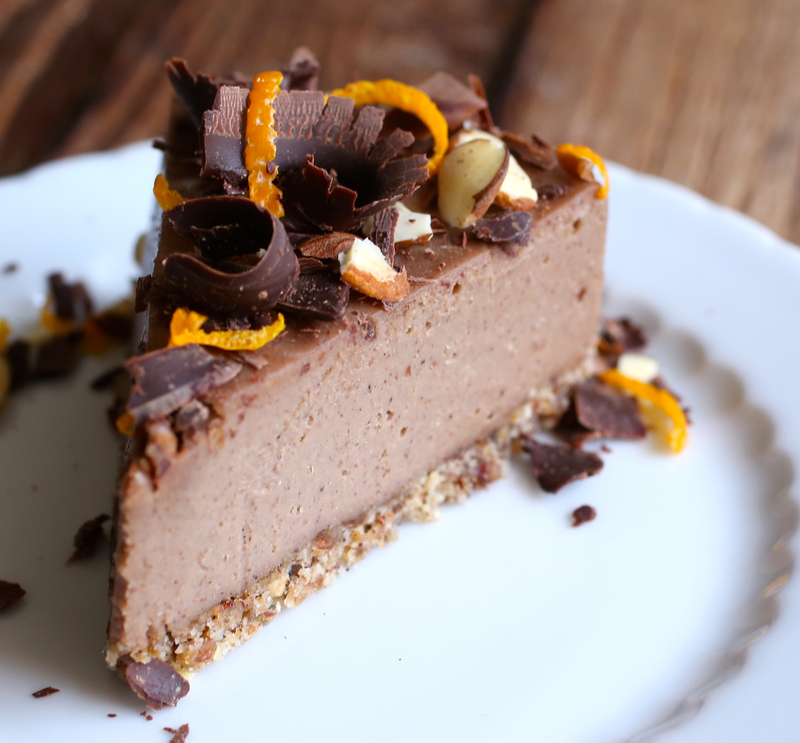 After my successful batch of Chocolate Orange-Cardamom Cookies, I thought I’d use the same delicious flavor combination in a raw cake/torte. I hope you like it! To make the crust, grease a 6- or 7-inch springform pan with coconut oil. Put the nuts, dates, and cacao powder into your food processor and process until well combined and the mixture forms a dough. If necessary, add a little coconut oil to help it bind. Press the dough into the bottom of the prepared pan and set aside. Make the filling. Put all of the ingredients into a high speed blender, like a Vitamix, and blend until rich and creamy, about 2-3 minutes. To achieve the smoothest filling, stop the machine periodically and scrape down the sides of the container. Pour the filling into the pan. Cover with aluminum foil and freeze the torte for at least 8 hours. Transfer the pan from the freezer to the refrigerator at least 1½ hours before serving. 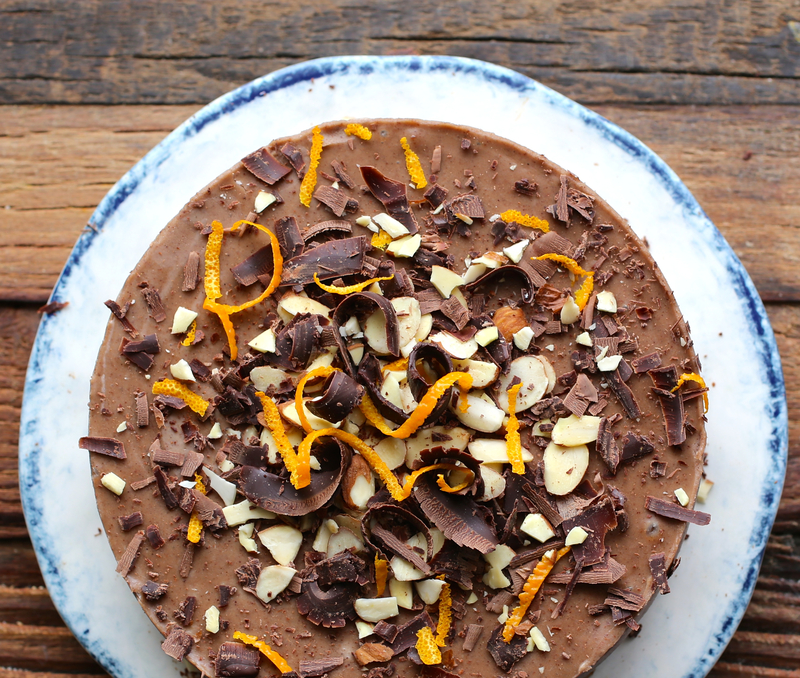 Remove the sides of the springform pan and then cut the torte into slices with a very sharp knife. Note: This filling will melt if left out at room temperature. 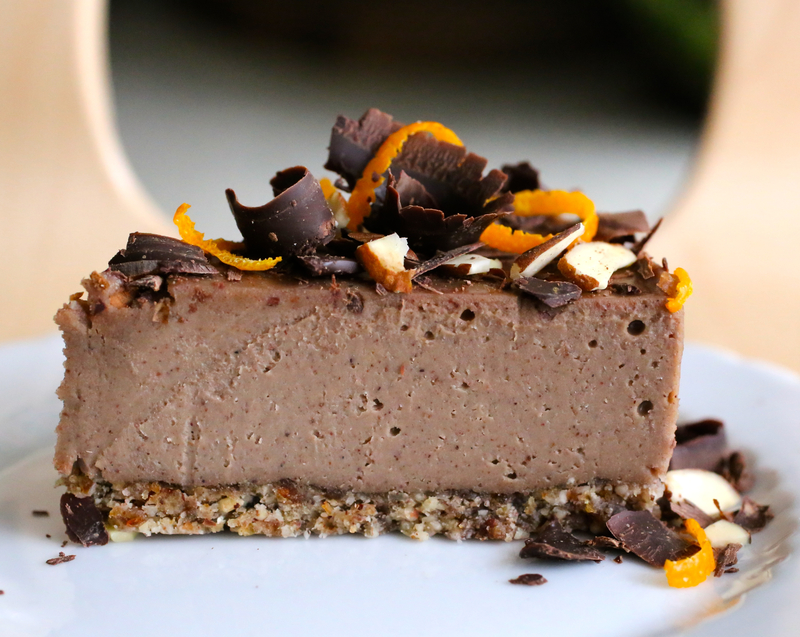 I’ve made this with and without cacao powder in the crust. In the photos above, I did not include it. The cacao powder darkens the crust, which looks quite nice. However, the cacao flavor can overpower the flavor of the dates. Thanks Laura, so happy you like this! 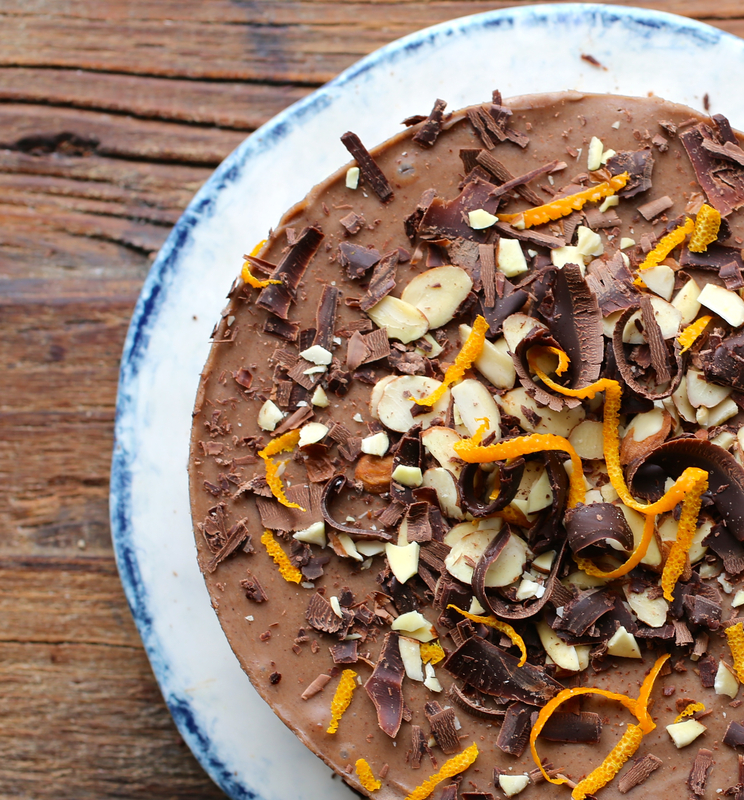 I love the orange & chocolate combination – so I can imagine this torte tasted divine. Nice that it’s a raw dessert too.. they are actually really hard to make! Thanks Thalia, I love the combination too! Just beautiful Martine! Another masterpiece! What a stunning tart. Gorgeous. You are so talented. Thank you for such kind words Amanda. I’m so glad you like this! Thanks so much! Fortunately it’s quite simple to make too!! !